Jim Olson’s family has owned a plot of land since the early twentieth century in Longbranch, amongst the lakes and national parks of Puget Sound, south of Seattle, where the architect’s grandparents built a holiday home. The house burned down many years later, and the only construction that remained on the property was a little cabin by the lake. Jim Olson says that in 1959, when he was only in his second year studying architecture at Seattle University, his father gave him 500 dollars and asked him to build a holiday home for the family and their friends on the land. At that time, Jim Olson went back to visit the place where he had spent his holidays as a child and decided that his project would centre around the cabin that still preserved the only traces of the family’s past on the site. 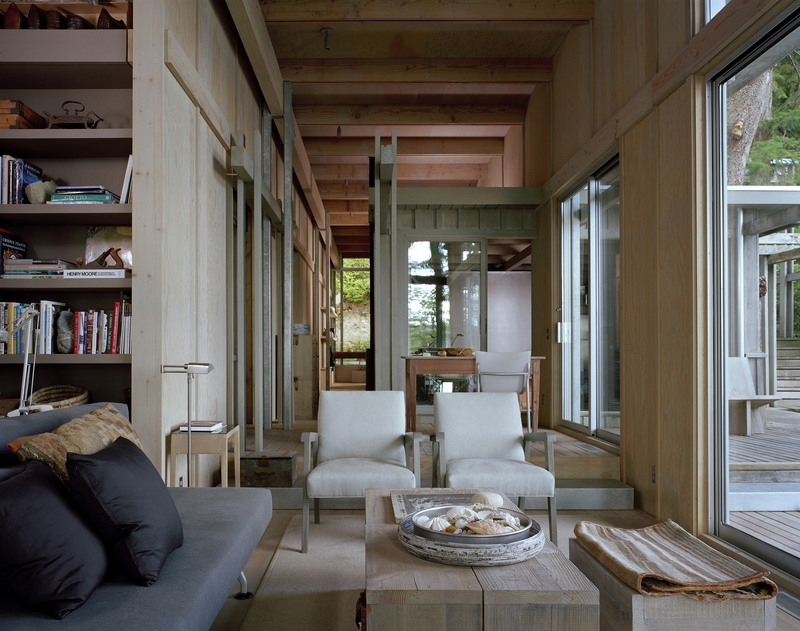 Over the years to come he was to build some of the most important residential projects of his career with Tom Kundig, not far from Seattle, where the spirit of that early project of his youth can still be found. Timber was the beginning and end of the project, the only material the young architect saw as suitable for a new construction in a forest of tall trees. The cabin consisted of a single room from which to look out over the extraordinary landscape of the lake across the way and the forested hill behind it. Jim Olson went back to the project over and over again as the years went by, without ever removing anything, but continuing to add one room at a time, with the intention of bringing his family’s memories to the place while making room for new people and new experiences. In 1981, when he was 41 years old and working for his own well-established studio, he expanded the project with two new rooms, a bathroom and a bedroom, forming three separate pavilions which, like the entire structure, were connected by a raised walkway. He used inexpensive materials such as timber and plywood, with spartan furnishings suited to a fisherman’s hut, and going from one room to another, even to the bathroom, meant going outside. The three primordial functions of living had always been and still were separate for anyone staying at Longbranch. As he continued to transform the refuge into a holiday home, in various successive stages Jim Olson decided to cover the three pavilions with a single roof and fill the spaces around them with practical, complementary furnishings, developing a sense of belonging to the building. The house had in fact never lost its sense of belonging to the land, but the family’s needs had changed with time: more and more people were using the home, there were small children in the family once again, the family had grown and the desire to get everyone together led to the introduction of new comforts. Without ever betraying its original structure as a series of separate volumes put together, the project traced tangents heading toward the mountain and the lake out of the original core, while the connection between the kitchen/living room and the new bedroom became the principal link. The initial tendency to use readily available materials was maintained: the structure consists of a series of double pairs of steel or wood columns supporting glulam girders, which in turn support a timber roof structure left in full view. All the infill walls, made of timber covered with plywood, alternate with a sequence of windows offering views over the lake from west to east. To the north, contact with the mountains, the land, stone and the forest is limited to glimpses through tall, narrow panes of glass. The fir floorboards inside the building continue onto the patio to ensure continuity between inside and out. Though it is unique in the way it has been modelled in response to the needs of a family that has evolved with the years, the holiday retreat has deep roots in the American tradition of organic architecture, from Frank Lloyd Wright to William Wurster, in which the new lifestyle is given form with an open floor plan, a flat roof, strip windows and patios that extend the living space out into nature.